Rahim on the land he once farmed, before the company forced him out. Image by Ian Morse for Mongabay. But that doesn’t explain why PTPN XIV felt empowered to demolish farms and cattle ranches, because it too lacks the permits required to operate in Maroangin. 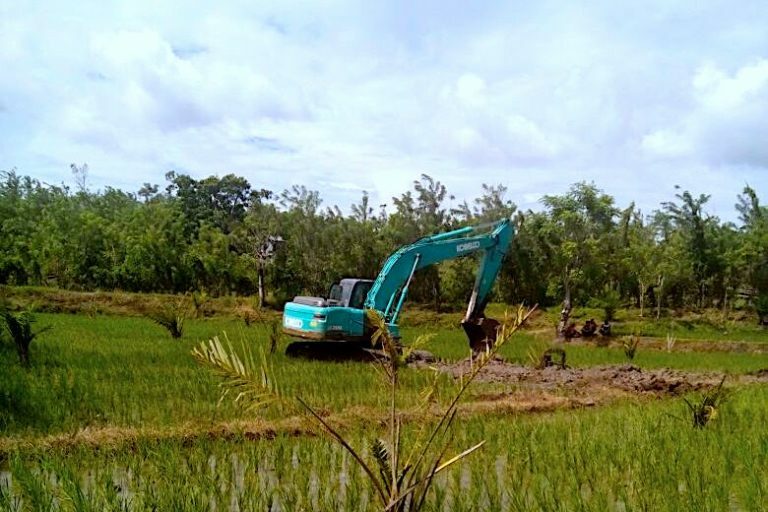 Nonetheless, the firm has gone ahead and planted 8 square kilometers (3 square miles) of oil palms on land formerly occupied by corn farms, rice paddies and pastures. Several months after President Joko Widodo ordered a freeze on the issuance of permits for palm plantations, PTPN XIV has started an entirely new business without any of the approvals required by law, eased along as a state-owned company. It has made a travesty of the permit process, operating outside the law, according to government officials and other observers. 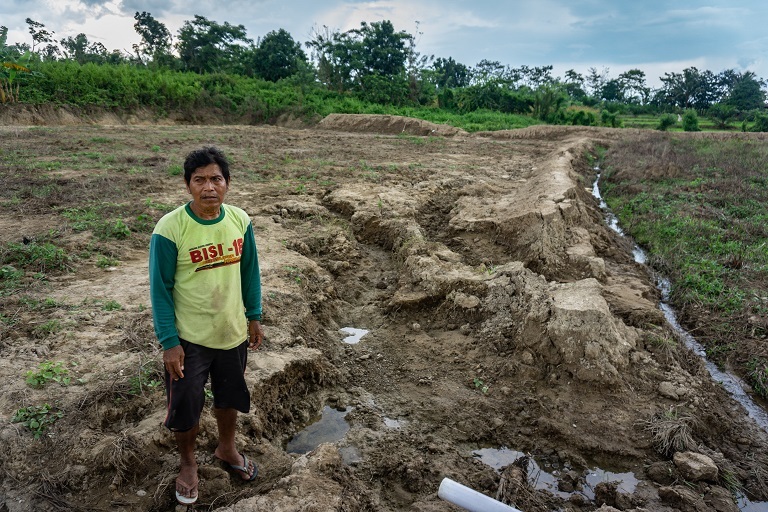 The case provides an example of how malleable the rules can be in Indonesia for powerful interests with an eye on community lands, even as Widodo strives to bring the nation’s chaotic land-tenure situation under control. Indonesia, home to thousands of islands spread across one-eighth of the earth’s circumference, is rife with competing claims over who has the rights to land and resources. Last December, the Indonesian government reached an important milestone in addressing this problem when it published the first version of a long-awaited, unified map of land-use claims and internal borders. But much data is still missing from the map, including maps of indigenous territories and company concessions. Meanwhile, the Ministry of Agrarian and Spatial Planning has refused to release maps of lands where companies hold licenses to plant oil palm, despite a 2017 Supreme Court ruling ordering it to do so. Last week, activists threatened to report the minister for criminal conduct if he continued to withhold the data. A bulldozer clears a path through rice paddies in Maroangin. Image courtesy of Rahim. In 2003, the land near Rahim’s home suddenly opened up. PTPN XIV had raised cattle and farmed tapioca there for the past 30 years, but its lease had just expired, leaving the 52-square-kilometer (20-square-mile) concession unattended. Thousands of farmers moved in, planting corn and rice and grazing cattle. Many families, including Rahim’s, grew to depend on the income from working the land, as residents had done before the company first arrived in 1973. Under Indonesian law, if a plantation company’s right-to-cultivate permit, known as an HGU, is not extended after the initial 30-year term, the land reverts to state control. 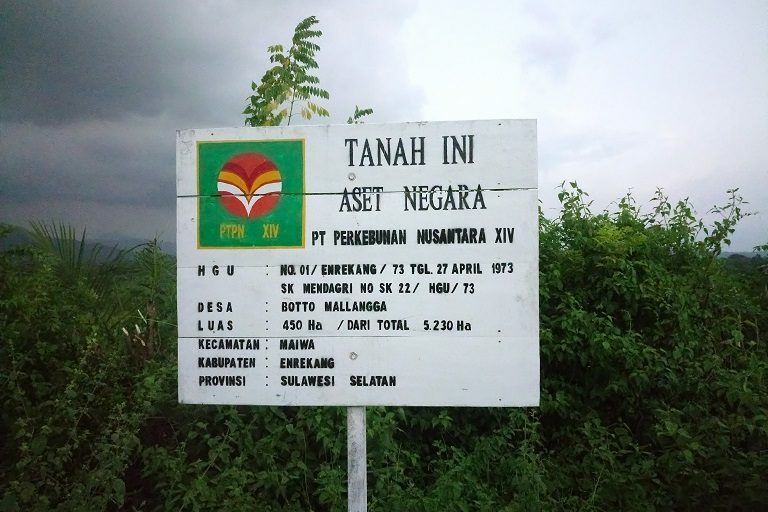 Jemmy Jaya, a spokesman for PTPN XIV, told Mongabay at his office in Makassar, the capital of South Sulawesi province, that the company still held the rights to the land because it too is state-owned. Since farmers were trespassing on the land, Jemmy said, the firm had called on Indonesia’s anti-riot police, known as Brimob, to “handle” the situation. In 2016, men with rifles strung across their chests began visiting the homes of Rahim and many others. Last August, locals reported the intimidation to the provincial government, and the visits stopped. But they started up again this past February, with officers ordering residents to vacate the land. 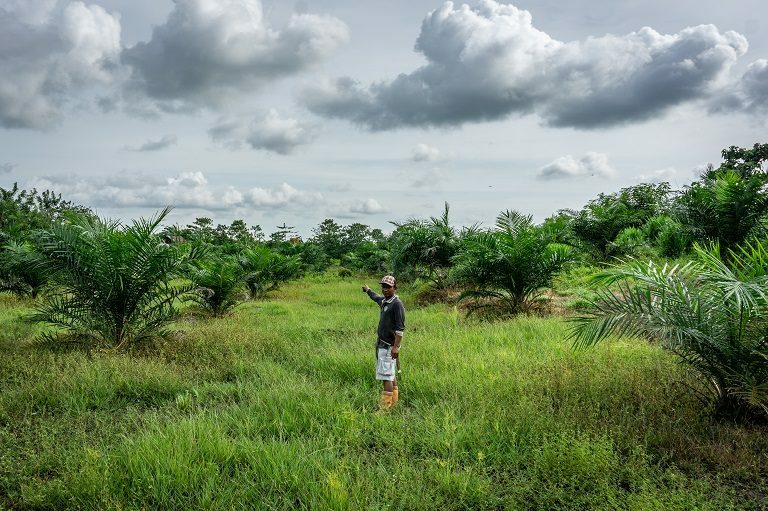 Jemmy acknowledged the company had yet to obtain an HGU, or any of the other permits it needed to plant oil palm in its former concession. But he said the firm had secured the necessary permissions to operate in the form of letters from Muslimin Bando, the head of Enrekang district, where the land sits. In Indonesia, district heads have the authority to issue key permits for palm plantations. Jemmy said the Enrekang chief had provided letters saying the firm would get permits in the future, though he declined to provide a copy when asked. “Why do I have to show you?” he said. “The community there should be grateful that we let them use the land for 15 years without asking anything in return,” Jemmy said. District chief Muslimin confirmed he had reached what was essentially a handshake agreement with the company, believing it would benefit the district. “We’ve gotten some pushback from the local residents because — well I don’t know the reason, because they don’t have title to the land,” Muslimin said in an interview. Saparuddin, 40, a farmer whose 20-hectare (49-acre) cattle farm is now covered in the company’s palms, learned from his parents a different history that portrays PTPN XIV as the guests on the Manhattan-sized concession. In the 1970s, very few farmers across the archipelago held a legal title to the land they worked. Dutch colonial policies continued by the Indonesian government marked all land without a clear owner as state property. The nation is still struggling to register the claims of farmers like Rahim and Saparuddin, even as district chiefs and other officials hand over huge tracts of land to corporate interests. Rahim and his neighbors have never had a title to the disputed land in Maroangin, because the state took control and handed it to the plantation company in 1973. Jemmy, the PTPN XIV spokesman, however, says there was nobody on the land when the company was allowed to farm it. The company’s sign in Maroangin still references the permit it received in 1973. It expired a decade and a half ago. Image courtesy of the Agrarian Reform Consortium. President Widodo has promised to address smallholder land claims and issue certificates for rights to land, having signed an order last September to accelerate the program. In all, he has pledged to distribute titles to 217,000 square kilometers (84,000 square miles) of land to farmers and communities, as part of a broader land reform drive. But progress has been slow. Colchester, who was made aware of the details of the dispute, said it seemed unique in that it had come to a head in the replanting stage, whereas most disputes begin upon the initial land acquisition. District chief Muslimin responded to the dispute early on, publicly declaring in 2016 that the company was not allowed to operate, at the time winning over much of the community. But he has since allowed the company to build a palm oil processing plant in the area. 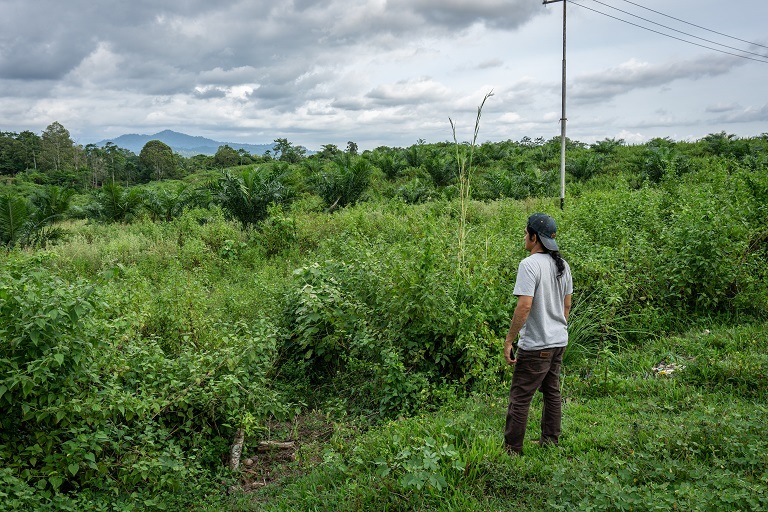 Because PTPN XIV seeks to produce not tapioca but palm oil, it would need the district chief’s sign-off on an environmental impact assessment, among other permits to be considered in compliance with the law. Muslimin said that when PTPN XIV farmed tapioca, there was little benefit to the district because it never planted more than half of the land. Letting the firm plant now, he said, ensured the district would also benefit through taxes when the company was operating. Dadang Suhendi, the head of the provincial branch of the agency that issues HGU permits, told Mongabay that his office had never received an application from PTPN XIV for the Maroangin concession and that the firm held no permit to use the land. Saparuddin looks out over land where his cattle used to graze. Image by Ian Morse for Mongabay. Muslimin said he would limit the company’s control to 30 square kilometers (12 square miles) to ensure no land went unused. The district has already handed other parts of the former concession area to a university, a botanical garden, other companies, and another district chief who has built a large villa on the land, according documents obtained by the Agrarian Reform Consortium. Jemmy said PTPN XIV had continued to pay taxes on the land even after its HGU expired in 2003, though Muslimin said that wasn’t the case. Muslimin said no land would be given to individual community members, and confirmed that residents had not been offered any compensation for the land. He agreed with South Sulawesi Governor Nurdin Abdullah that palm oil would bring revenue to the district. Abdullah, who won election last year on a conservation platform, made headlines last year when he said shortly after the vote that the province was no place for palm oil and mining. But he moderated those statements in an interview last month, while signaling he was monitoring the situation in Maroangin. Banner: Rahim in Maroangin. 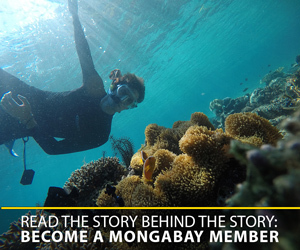 Image by Wahyu Chandra for Mongabay.